Eat good food and watch sports on TV. It isn’t complicated. Perfect For: Classic Establishment Dining Solo Eating At The Bar Late Night Eats Sports! In a Manhattan neighborhood that’s undergone a modern facelift over the last twenty years, it’s good to know not everything has changed. With the exception of a couple of new flat screens, Walker’s is pretty much exactly the same as your Pops left it back in the day when this tavern was the place to be on a Saturday night. 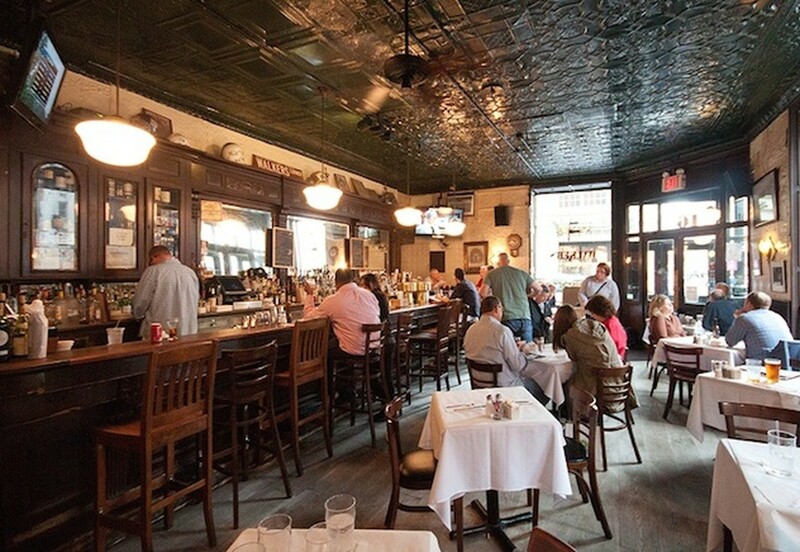 Walker’s is a Tribeca landmark - a prime example of a Classic NYC Establishment, and a low key spot that attracts an older crowd who enjoy a good burger and some Sports on TV. Rich with history and solid beers on tap, Walker’s serves up above average pub fare and makes up for things being a bit overpriced with large serving sizes. If we’re in the mood for a burger in Tribeca, we go to Walker’s without hesitation. This big, fat, juicy eight ounce sirloin burger isn’t the greatest burger in history, but it gets the job done right. It’s a classic tavern burger, a few steps above what you would find in a good diner, and a couple of steps below a joint that specializes in burgers. The fries are average. This right here is a Walker’s go-to. A huge plate of chicken that’s got a specific salty, garlicky flavor to it. It’s probably been the same recipe for forty years. Served with a mountain of mashed potatoes and some greens, for fifteen bucks, you really can’t go wrong. In theory, this should be really freakin’ good - shell steak on nice thick bun with caramelized onions, fries, and greens. But it’s one of those steak sandwiches thats hard to bite into because it’s just one big slab of steak in between the bread. There are some people who like this style of steak sandwich, but not me. Definitely go burger or salad over this. I always feel that restaurants get a little too cute with Nicoise salads. Yes, it’s nice to have an egg and green beans in the salad, but we still need some roughage to get down on too. Walker’s doesn’t get too crazy on the crazy veggies and you wind up with a good balance and sizable chunk of grilled yellowfin tuna. When I worked in Tribeca, I used to get this for lunch all the time and always left satisfied and full. On a cold day, the Walker’s cowboy chili with sour cream, cheddar, and onion might save your life. Around since 1980, The Odeon is a New York City classic. It may not be the same downtown destination that it was thirty years ago, but they still serve very respectable bistro food and stiff drinks, and brunch is always reliable. We’re not sure what recent market research indicated that Tribeca desperately needed two more upscale bar food restaurants. With no vibe and mediocre food, the drinks aren't enough to bring us back for more.